Eye cups aren’t by nature comfortable but they serve their purpose of filling the gap between your eye and your camera’s viewfinder. Still, after long shoots, having a more comfortable option could make a big difference. The i-cuff fills that need by adding comfort and better control. All eyecups have been made out of rubber till the introduction of i-cuff dv, Pro & HD. 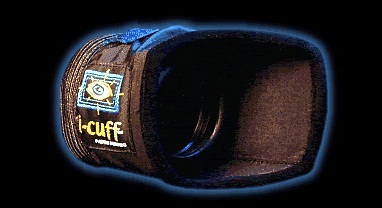 i-cuff’s are made out of a breathable (reduces fogging), washable and waterproof fabric. i-cuff attaches easily with a velcro sleeve, has an ultra-soft and padded suede chamois that comes directly in contact with your face and absorbs sweat/oil and doesn’t leave residue on glasses like rubber eyecups. Extremely comfortable for long days of shooting! They will withstand 100,000 rubs before they go bad! i-cuff is the only eye cup that fits the operator’s face (with or without glasses) cutting the light entering the viewfinder like no other product. Can be used on home video (mini dv) cameras, pro cameras, dslr’s as well as telescopes, binoculars, spotting scopes, microscopes and gun scopes. You can rotate i-cuff 45 degrees counterclockwise and it will provide viewfinder shade when shooting under arm low or overhead when the camera is away from the operator’s face. See what Philip Bloom thinks of the i-cuff here. Find out more information and pricing here. This is a great invention. Not only am I using it with my AF100, but with my Canon 35mm DSLR rigs too. God it’s comfortable and the reduced fogging is incredible. Plus it even wraps around my glasses!